Every time I think of this story I laugh and laugh. 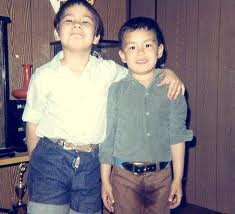 My friend peed his pants at school when he was a leetle tiny boy. His friends were like, "did you pee your pants?" He was like, "No. Ummm....my mom accidentally washed my jeans with my dad's tuxedo." B. We are rich and my dad has a tuxedo. C. She WASHED the tuxedo, instead of drycleaning it. C. was also one of my first clues.